Linda and Julie began experimenting with rolled sandwiches in a Tex-Mex restaurant they opened right out of high school. A friend's deli was across the street, and the women began substituting beans and rice with ham and cheese - and discovered a great taste and unique sandwich idea. 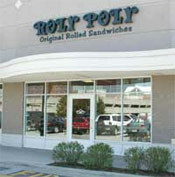 The first Roly Poly opened in Atlanta, Georgia in 1996. The location, right in the heart of Buckhead, was within a half mile of other sandwich competitors such as Subway, Gorin's, New Yorker Deli and Schlotzsky's. From the beginning, Linda and Julie were rolling 300 sandwiches a day in that store - and they're still selling Roly Polys there as fast as they can roll them. 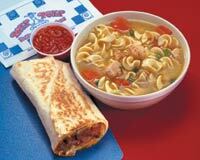 Roly Poly Franchise Systems began in January 1997, soon after the success of the Atlanta opening. Within the first year franchises were sold in upscale, high profile locations from Seaside, Florida to Westport, Connecticut. There are currently over 130 Roly Poly locations throughout the United States. Over 3 million Roly Polys were hand-rolled last year, and each location continues to provide the unique, healthful sandwiches that Linda and Julie created years ago. There are hundreds of franchise opportunities out there, but Roly Poly stands apart from the rest. Rather than burgers, pizza and subs, we offer fresh, unique tortilla rolled sandwiches. Our operational system is easier than most of the quick serve restaurants, and the support we offer our franchisees is comprehensive. The Roly Poly franchise system is one of the easiest quick serve restaurant concepts to operate. Our non-cooking concept is clean and preferred by landlords. Roly Poly requires only 800 to 1,600 square feet for each location, giving Roly Poly the ability to go into some non-traditional locations. Since Roly Poly is a non-cooking concept, our equipment package is very inexpensive averaging under US$30,000. The product line contains over 50 freshly rolled tortilla sandwiches some, which are served cold and some hot. Roly Poly also offers soups, cookies, chips, and side salads. Roly Poly has an unmatched franchisee-training program. Our Director of Training, Greg Brown, holds your hand through out the entire opening process. Training consists of 1 week at a corporate training store and 2 weeks of training at the franchisee's store. The assistance the operations team gives is more then enough to make sure and franchisee with or without restaurant experience is on the right track for success. Roly Poly Franchise System is committed to helping franchisees market their locations. Roly Poly works with talented graphic artists, advertising agencies, and marketing strategists to produce effective marketing plans both nationally and locally that include television ads, billboards, radio, menus, point of sale materials and more. The Roly Poly product offering makes itself an office manager's dream for catering options. Our sandwiches can be delivered at any time and stay perfect for hours, which gives Roly Poly a clear advantage over the other sandwich shops. If you going to enter the world of franchising go with a proven winner Roly Poly. To learn more about the Roly Poly sandwich shop franchise opportunity, simply complete the form below.